On Monday December 3rd Mrs. Sara Ann Smith, age 90, was reunited with her husband in heaven on their 69th wedding anniversary. Mrs. Smith passed away at Kate B. Reynolds Hospice Home. She was born in Bucks County, PA on October 6, 1928 to the late Francis J. O’Boyle and Sarah Groff O’Boyle. During World War II her father relied heavily on Sara to keep his business operating while her two older brothers went off to war. Mrs. Smith was a devoted Catholic her entire life and a member of Saint Leo the Great Catholic Church for over 20 years. She was well known and admired in her neighborhood as a daily walker. 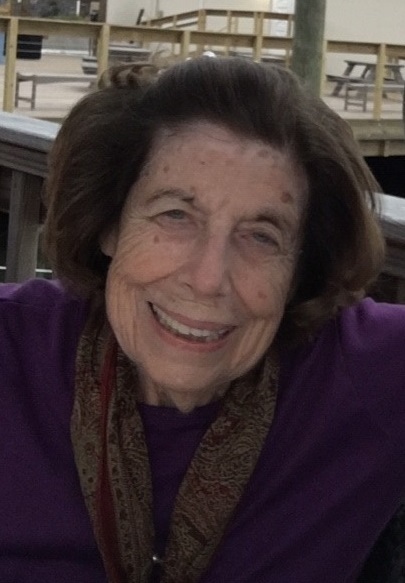 She was also an avid reader who loved reading the news, books, and visiting the Lewisville Library. Mrs. Smith enjoyed traveling, going to the beach, keeping up with current events, and spending time with her family. Preceding her in death was her husband, Robert K. Smith; infant son, Peter J. Smith; grandson, Michael G. Smith; two brothers, Francis W. O’Boyle and Vincent O’Boyle. Surviving are her children, Lucy Hardison (fiancé, Jim Albright), Robert Smith (Kathy), Sara Tovar (Rudy), Kenneth Smith (Cindy) and Jonathan Smith (Catherine); grandchildren, Sarah Hardison, Catherine Henry, Leslie Smith, Rachel Smith, Jordan Tovar, Emily Tovar, Dylan Smith, Cooper Smith, and Dalton Smith. Also surviving are her great-grandchildren, Lucy Villarreal, Rebecca Hardison, Nolan Henry, and Cricket Henry. A memorial mass will be held 11:00 AM Thursday, December 6, 2018 at St. Leo the Great Catholic Church with Father Felix Nkafu officiating. The family will receive friends from 6-8 PM Thursday at Hayworth-Miller Lewisville Chapel. An inurnment service will be held for her and her husband, Robert at 10:00 AM Friday, December 7, 2018 at Salisbury National Cemetery. Flowers will be accepted or memorials may be made to St. Leo the Great Catholic Church, 335 Springdale Avenue Winston-Salem, NC 27104 or to Trellis Supportive Care, 101 Hospice Lane Winston-Salem, NC 27103. Online condolences may be made at www.hayworth-miller.com.